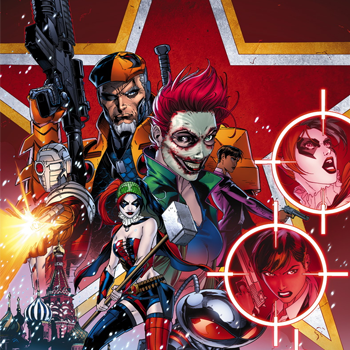 With Batman v Superman: Dawn of Justice still getting most of the ink, Warner Bros has been quietly setting up the rest of its DC Comics Movieverse on the sidelines; with the project currently furthest-along being the dark supervillain team-up Suicide Squad from director David Ayer. Casting rumors have swirled for months, but today Warner Bros announced the official lineup for the feature; which involves a group of famous DC Comics villains who are granted pardons in exchange for carrying out high-risk missions for a shadowy government organization. The Wolf of Wall Street's Margot Robbie will play Harley Quinn (a female counterpart to The Joker), Will Smith is the master-assassin Deadshot, Tom Hardy is team leader Rick Flagg, Jai Courtney is Captain Boomerang and Cara Delevingne is the magic-user Enchantress. Finally, Jared Leto will take over the high-profile role as the new Joker. Jesse Eisenberg's Lex Luthor from Dawn of Justice is also believed to be part of the project in some unknown capacity. Still yet to be cast is Amanda Waller, the hard-nosed government official traditionally depicted as running the "Suicide Squad" program. According to Variety, WB's first choice for the part is Oprah Winfrey, with Viola Davis and Octavia Spencer also being considered. Suicide Squad opens in August of 2016.